The traditional sporting event will be held on Sunday May 15th with the participation of 500 athletes from different states in Mexico. The Triathlon is endorsed by the Mexican Triathlon Federation in the children’s, sprint and relay categories. The exclusive resort offers special All Inclusive packages and Day Passes so competitors and their companions can enjoy the Hacienda Tres Ríos experience. Cancún, Q. Roo (February 2016) In order to promote the Mexican Caribbean as an attractive destination for sport tourism, Sunset World Resorts & Vacation Experiences and MasAcción announced the 6th Hacienda Tres Ríos Triathlon in the Rivera Maya to be held on Sunday May 15th, with the participation of around 500 athletes from different parts of the country. In a press conference, the General Director of Operations at Sunset World, Germán Fayad, said that the Hacienda Tres Ríos Triathlon, with the slogan Accept the Challenge, has become established as one of the best at a national level due to the beauty of Tres Ríos Nature Park, its impressive routes through the jungle, and the All Inclusive being offered by the resort to athletes, their companions and spectators so they can enjoy the event to the fullest. “In every edition, we make the effort to improve the logistics and our objective is for the competition to reach the Olympic category”, said the director pointing out that this is the only triathlon that takes place in an exclusive 326 acre Nature Park where athletes have the privilege of swimming in the Caribbean sea as well as a spectacular river and running by mangrove forests and sinkholes. MásAcción’s Competition Director, Carly Casarrubias, invited all athletes, triathletes, runners, cyclists, swimmers and general public to dare to overcome their own limitations and participate in the sixth edition of the traditional men’s, women’s and mixed sporting competition to be held in the children’s, sprint and relay categories. The organizers explained that the children’s category will be open for girls and boys ages 6 to 15 that will participate in 4 different swimming, cycling and running distances. In the sprint and relay categories the ages can range from 16 to over 65 on a swimming route of 750 meters, 20 kilometers of cycling and a 5 kilometer run. 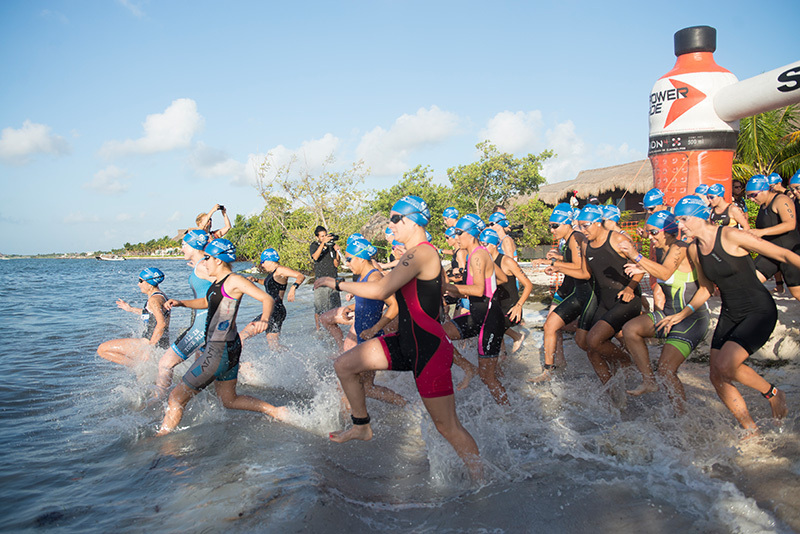 “This year will be important for the state in regards to sports as it will host several national and international sporting events, including the Hacienda Tres Ríos Triathlon, which is endorsed by the Mexican Triathlon Federation”, explained the Representative of the Quintana Roo Triathlon Association, Fernando Martínez.